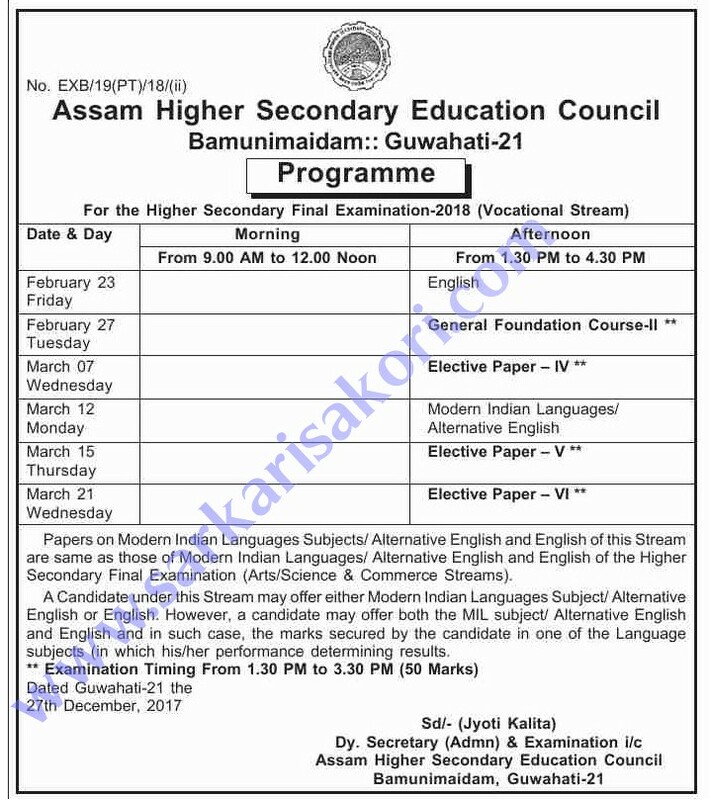 Assam HS Exam Routine 2018 or AHSEC Exam Routine 2018 Programme (12th Class) notification to download it from Assam Higher Secondary Education Council website in pdf format. Assam HS Exam Routine 2018 or AHSEC Exam Routine 2018 Programme (12th Class) notification for final Exam is out now. Download it from Assam Higher Secondary Education Council website in pdf format. The Assam Higher Secondary Education Council has recently uploaded the AHSEC exam routine 2018. So all Students who are going to seat their HS Final Exam 2018 can be Download HS final exam routine 2018 PDF format through below-provided table or link for Arts, Science, Commerce & Vocational Stream. The Assam HS 2nd year Examination will start from 23 February to 22 March 2018 and the Vocational Examination will start from on 23 February to 21 March 2018. Hindi, ‘Khasi, Manipuri, Mizo, Nepali & Urdu. From 1:30 p.m. to 4:30 p.m. Secondary Final Examination (Arts/Science & Commerce Streams). subjects (in which his/her performance determining results. Now save or print your exam programme. You can also download the Routine directly from below given link. 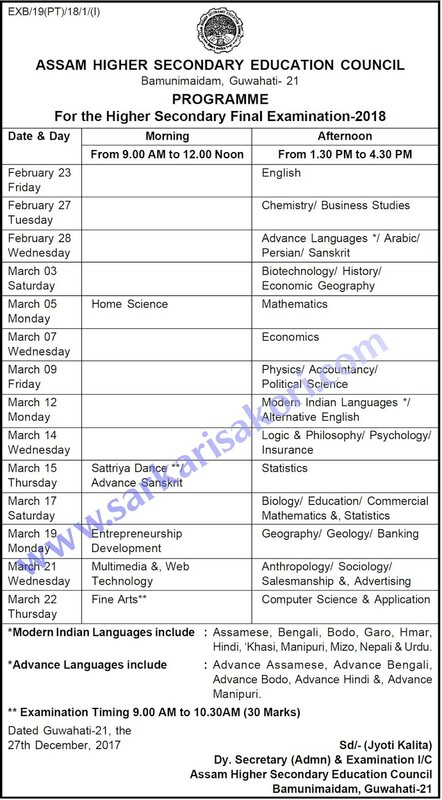 AHSEC Exam Routine 2018 Download in PDF / JPEG format for Arts, Science, Commerce, and Vocational Stream. You will be interested more in Assam HS Exam Routine 2018 & Latest Assam Govt Jobs Alert 2017.